Have you read The Story Girl yet? I'll give you a good reason to, if you haven't yet! Now, both of these titles are available for free on the Kindle but if you're like I am, you prefer having a hard copy of a book in hand. 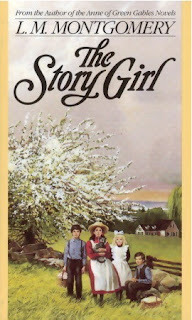 If you're that type of person and you'd like to read The Story Girl then you'll be glad to know I have one copy to give away to one of you. Care to win? Simply leave a comment in the comment section below to be enter. DO REMEMBER to leave a valid e-mail address as well. I am screaming with joy when I saw this giveaway...please count me in. I haven't read this one yet, so please count me in. I would love to win (and read this!). I loved the Anne books, but never delved into her other ones. Thanks for the chance to win! Oh, thanks for the chance to win. I have all of the Anne of Green Gable books. I have the free Kindle copy but print is better! Fun giveaway. Thanks for the chance to win a paper copy.